The Mittal brothers are giving the conglomerate a makeover. The excitement in the ballroom of the Oberoi was palpable. Print journalists had their BlackBerrys on hand to fire off a story, the television channels had sent their best and prettiest. After all, it was a lastminute press conference called by Bharti Enterprises, the holding company for Bharti-Airtel, Bharti-AXA, Bharti-WalMart, Bharti-Retail, Bharti-Teletech. And that had the assemblage wondering: Was Sunil Mittal, the group’s now not-so-young but still dynamic chairman, going to announce a big takeover of some international firm? Was this going to be panacea for the troubled times? But nothing of that sort happened. All that Sunil Mittal did was unveil—with the help of a rather boring advertisement— a new brand identity for Bharti by giving its “logo”, in his own words, a more “youthful” look, the overriding aim being to make Bharti “India’s finest conglomerate” by 2020. This is a large step forward from his flagship company Airtel’s aim of becoming India’s “Most Admired” company by 2010. Indeed, the latest exercise is a logical evolution of Sunil and his brothers Rakesh and Rajan’s plan of making telecom a smaller part of the group’s operation. Part of this change is going to get reflected in retail, the first place where the new logo will be prominently seen. Rajan Mittal said the group’s retail ambitions had not slowed down following the recent doom and gloom. “Our plans continue apace,” he said, without giving any timeline for further store launches. Also present at the press conference was Akhil Gupta, the financial wizard behind Bharti Enterprises. He claimed that Bharti-AXA, his baby, was doing all right even though the financial services sector had been hit hard. “We will use our extensive knowledge of selling to retail customers to improve the selling of financial products,” Gupta had told BT in a prior interview. “There is a lot of mis-selling happening and we want to educate the customer,” he had said. However, at the presser, Gupta ruled out the possibility of Bharti getting into banking anytime soon. 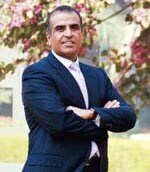 Even as Bharti tries to train focus on its other businesses, telecom remains the main money-spinner for the group and Sunil Mittal is looking forward to the day when Bharti crosses the landmark of 100 million subscribers. He, however, refused to be drawn into any talk on the controversy surrounding the latest telecom licences.